The weekend of November 20th I packed up the kids, the van, and my favorite husband and we headed off to Chicago for the Toy and Game Fair at Navy Pier. Being my first toy and game fair I wasn’t sure what to expect but it turned out to be an absolute blast! Over the course of the weekend we went to both the Museum of Science and Industry and the Field Museum for the first time, as well as our first Toy and Game Fair. I loved the museums and I especially liked seeing Sue the T-Rex’s amazing bones. So, you’d think I’d tell you that one of the museums was my favorite part of our weekend getaway. But maybe I’m not a normal kind of gal because the Toy and Game Fair turned out to be my absolute favorite part of the weekend. It was so inspiring to see these entrepreneurs bring their ideas to life. 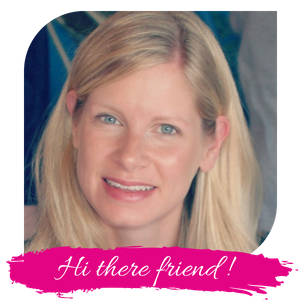 I loved seeing what other people have designed, created and brought to market, some for the first time. And it was also just plain fun. I loved spending time with the kids and Joey, taking our time checking out the latest and greatest games, trying them out, and even getting a few freebies along the way. 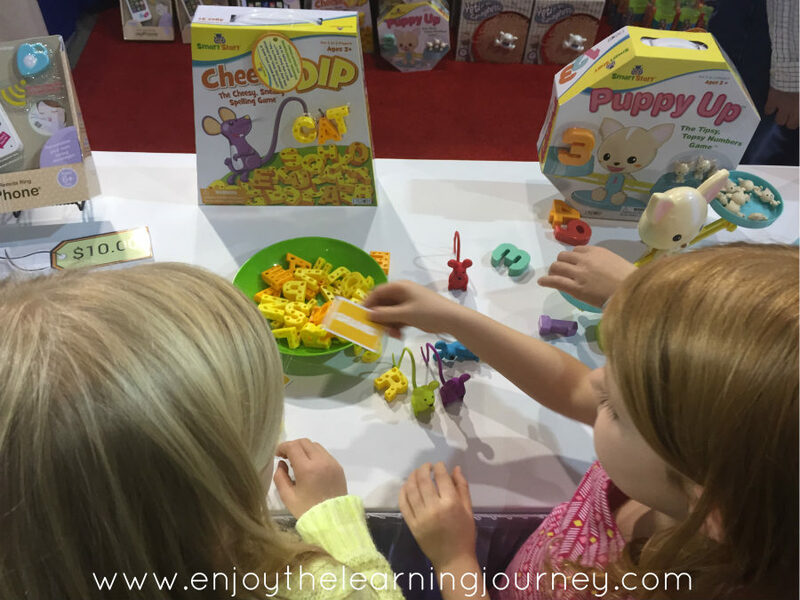 So, let’s take a walk through some of the highlights of the fair as I share our top picks, what items might make their way under our Christmas tree this year, and toys and games that you just might love. 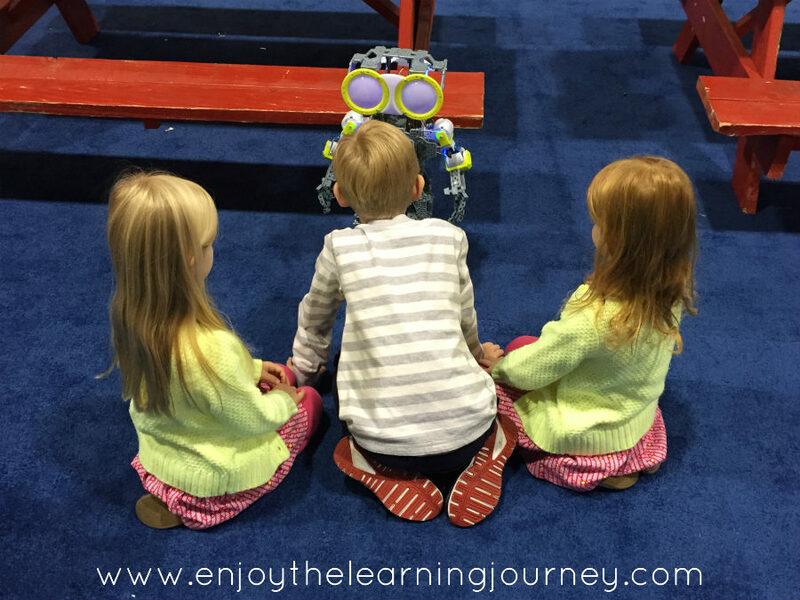 Meccano MeccaNoid G15 Robot – Do any of your kids have an interest in building and/or robots? This would be a amazingly awesome gift for them. All three of our kids were mesmerized by this little dude. Maze Racers Game – We talked to the creator of the game and I really enjoyed hearing his story. I was impressed with the concept and the quality of materials for this game. Kellan and his dad played a match by creating their own mazes and then switching boards and trying to roll the ball through the maze and back more quickly than each other. 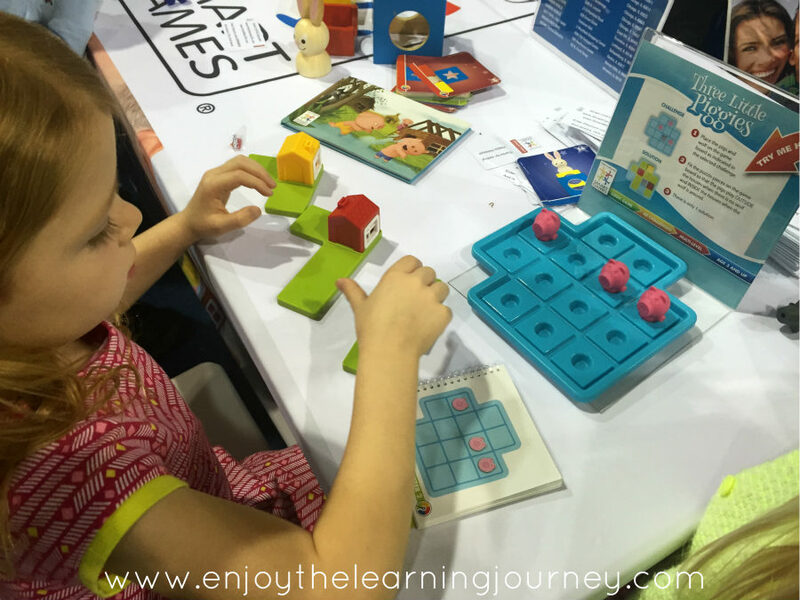 Three Little Piggies – an individual logic game that this little gal absolutely loved. 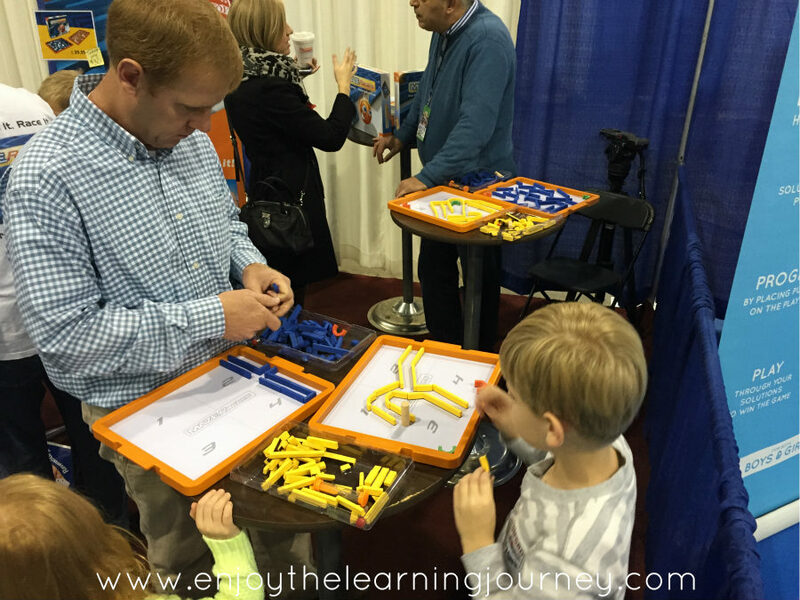 We have quite a few ThinkFun individual logic games at home and she’s never shown an interest in them but the Smart Games were a different story. We could barely pull her away to give her sister a turn. I’ve already ordered this game for her for Christmas. 🙂 Smart Games had several really great individual logic games that attracted the kids attention, such as Bunny Boo . We didn’t try out Camelot Jr. but that one looked like a lot of fun too. Cheese Dip Board Game – I am such a sucker for learning games like this and just love this cute little game by Patch Products. Your child picks a card and then works to spell the word with the little cheese letters. They can use their mouse to work on their fine motor skills by carefully picking the letters out of the bowl with their mouse’s tail. Yeti in My Spaghetti Board Game – I didn’t get a photo of this one but it’s also by Patch Products and made it into Family Fun magazine as the Toy of the Year. It reminds me of the game Ker Plunk from when I was growing up but much, much cuter. Razor DeltaWing – This scooter is self-propelled and moves forward when the rider moves their feet back and forth. It reminds me of a standing version of the Original Flying Turtle scooters. 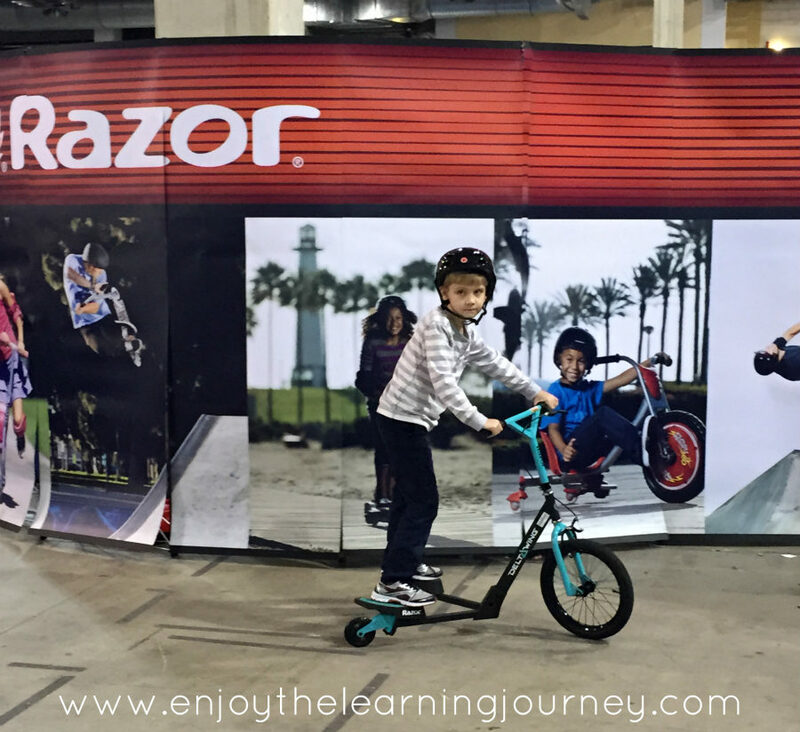 A fun variation to the standard Razor scooter and recommended for kids 6 and up. Sago Mini Apps and Sago Mini Plush Animals – The kids took a little break and sat down to play some of the Sago Mini apps. The characters in these apps are really cute and the games are perfect for 2-4 year olds. Since our kids are a little older they didn’t get into some of the games but they did really like Road Trip and are saving up to purchase it on our iPad. 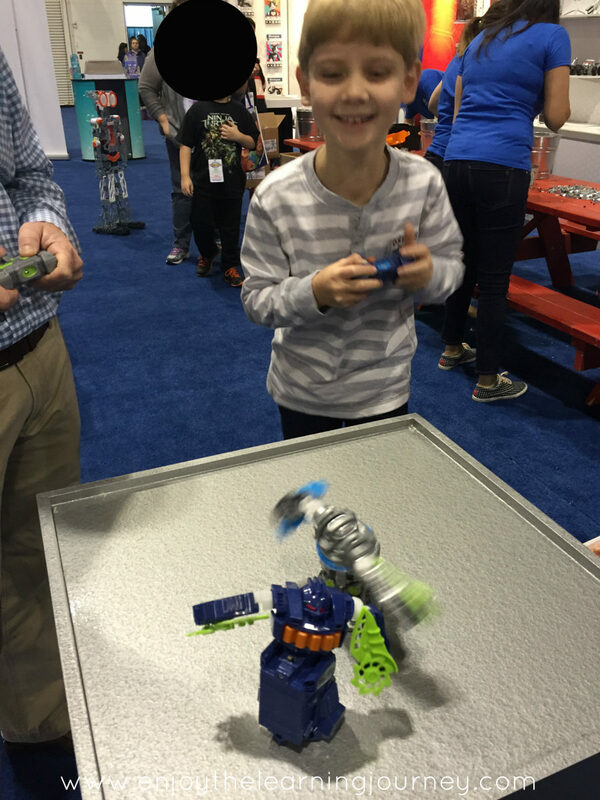 Air Hogs Smash Bots – Perfect for boys, these bots spin and fight. See the boy laughing and jumping in the photo? Yeah, he sure did love these. He enjoyed them so much that he asked to come back to them a second time before we left the fair and then when we got home he added this to his Christmas list. 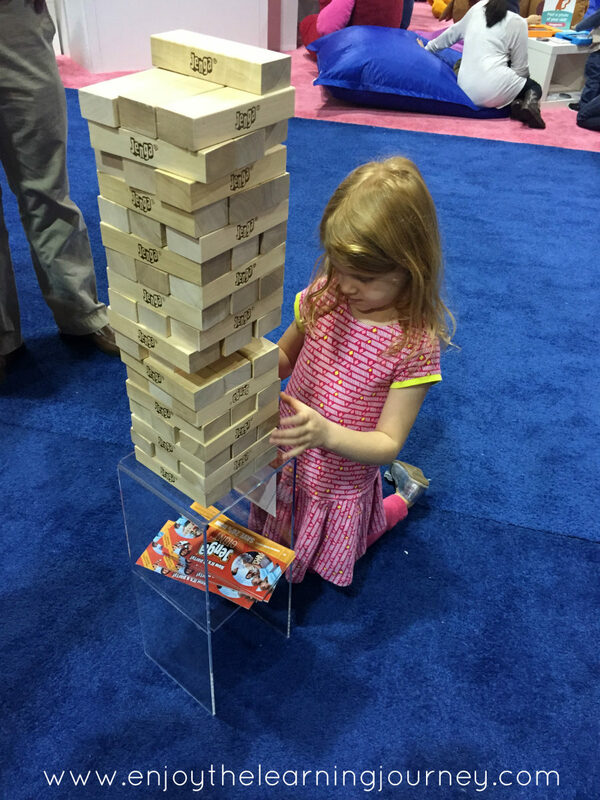 Jenga GIANT – A larger version of Jenga perfect for parties! It’s exactly the same as the regular version of Jenga Classic Game except BIGGER! 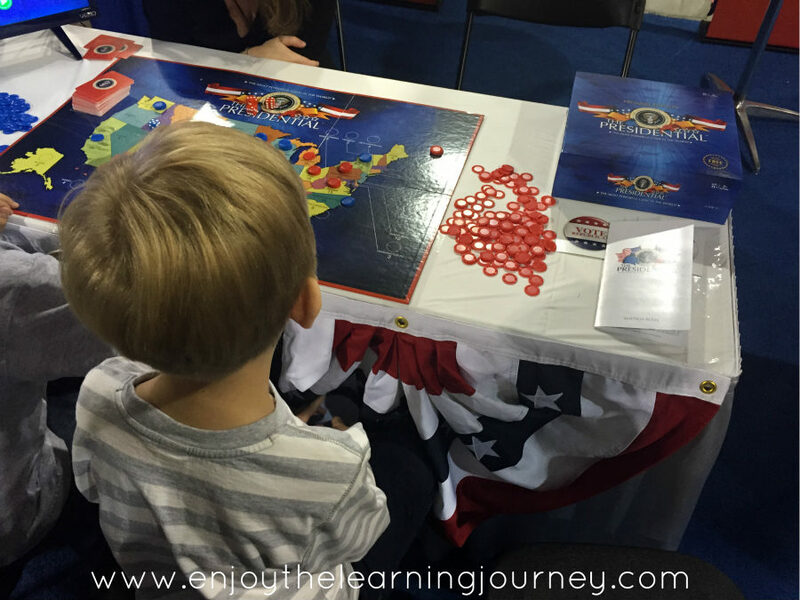 The Presidential Game – “Do you want to be the next president of the United States?” Kellan responded with an emphatic “yes!” and stepped right up to the table. Although this game is geared for ages 11 and up, at age (almost) eight he had no problem catching on as he and his teammate chose whether to campaign or fundraise on their turn. He was exposed to the Electoral College process through this exciting game. And he was actually jumping out of his seat with excitement as he and his teammate neared and then reached 270 votes! Edwin the Duck – Oh my word. This little duck was amazingly fun and cute and one of my personal favorites from the fair. Edwin is unique, adorable, seems to be very well-made and has multiple uses. Your child can hold Edwin in their hands and use him as a remote (like a Wii remote) as they play learning games on the accompanying app. He is also equipped with bluetooth and can stream music, he can be used as a nightlight and as a regular ‘ole bathtub toy. If our girls were two-years-old and not five I’d pay the $99 and get Edwin for them. However, since he is a pretty pricey little duck and I think they are at the top of the age range, I won’t be purchasing him. (The person I talked to at the fair said Edwin is for kids up to nine-years-old but I think he is best suited for ages 1-5, maybe up to 6). Edwin the Duck won over Jenna’s heart and is her #1 pick from the Toy and Game Fair. Sew Cool Sewing Machine – This “sewing” machine by Spinmaster doesn’t stitch with thread but it’s needles pull up the fibers of the felt and attach it together. It’s pretty nifty how it works and I absolutely love the concept and the fact that at five-years-old our girls are able to “sew”. Although it is recommended for ages 6 and up, a five-year-old should be able to do some of the easier projects with no problem. There are Sew Cool Kits available for purchase that can be used with the machine at various degrees of difficulty. The only thing that concerned me with this machine was the fact that it got stuck/jammed and had to be turned on and off more often than I think it should have. 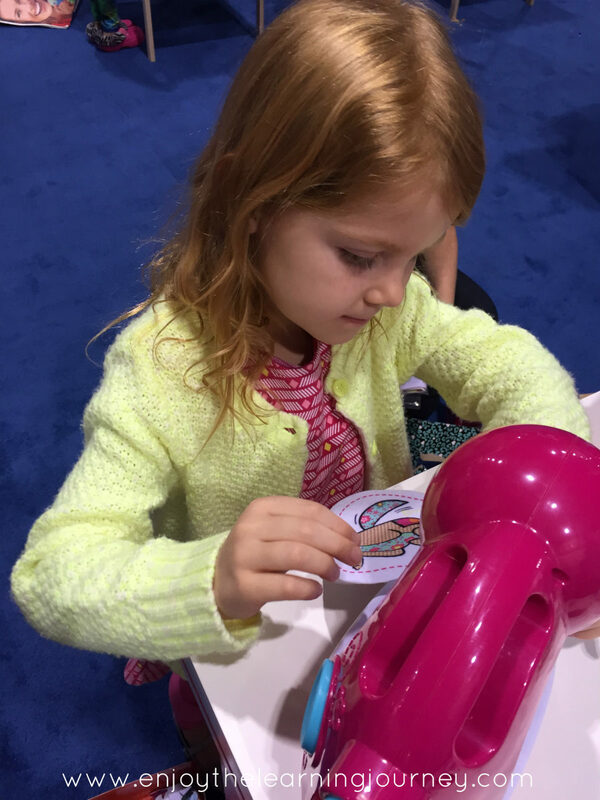 The Sew Cool Sewing Machine is Alaina’s #1 pick from the Toy and Game Fair. And in fact, I could hardly pull her away from it to go look at other things. She is hoping this little machine will be under our Christmas tree this year. 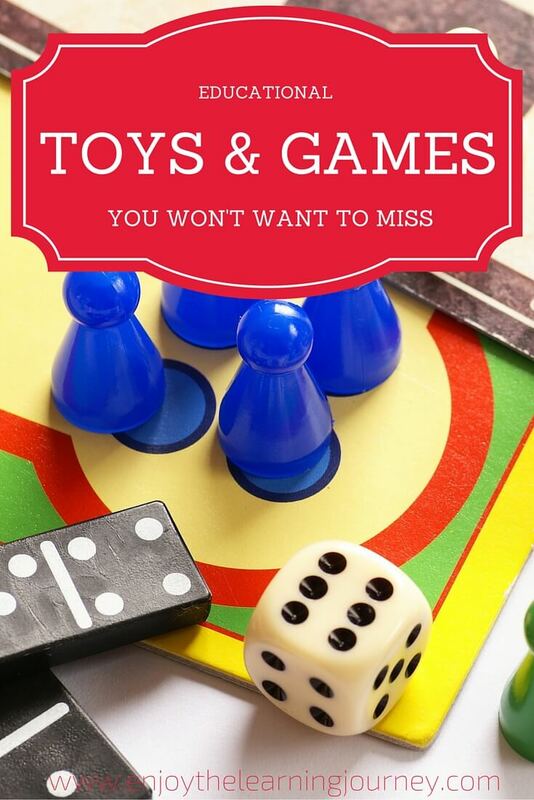 Do you think your children would be interested in any of these toys and games?